The Google Dashboard is a handy tool for keeping up with what information Google has stored for you in its various different products. One piece of the handy information, though, has taken a while to become available but it's there now: your Android devices. It's unclear if this feature has been around for a while, but either way, it's useful. 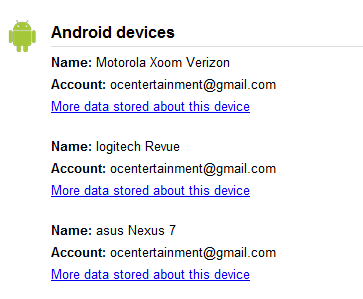 If you'd like to see which devices are registered with Google, and more interestingly, which apps on those devices have backups stored on Google's servers, you can do so from your dashboard. Unfortunately, as with a lot of information on the Dashboard, you can see this info, but you can't do much with it from here. On the Play Store, you can choose to hide certain devices in your settings, but they will all still show up here. Moreover, you can see which apps choose to create backups on Google's servers, but you can't restore any of them via this console. It's also unclear what constitutes a "backup". The list of apps that have backups, even on my most-used devices, are pretty sparse. 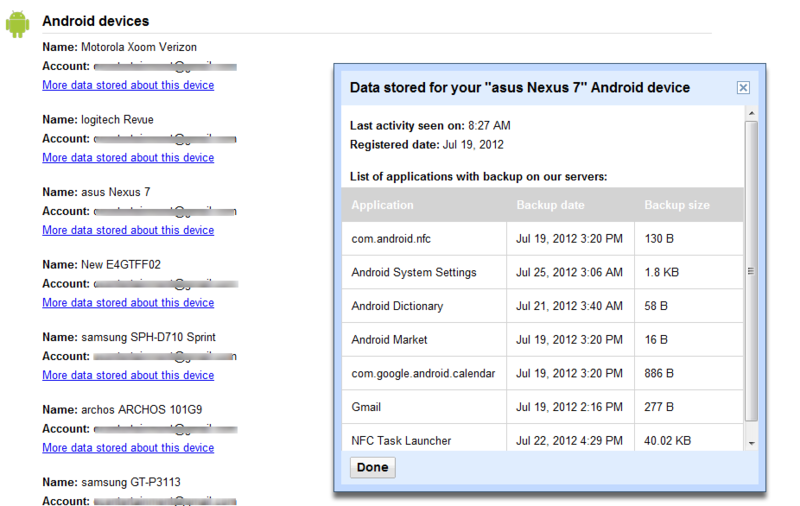 My phone and Nexus 7, my two primary devices right now, have no more than 7 backups listed. Of those, the overwhelming majority of them are from Google. Either virtually no developers choose to use Google to sync/backup app data, or these app backups are for a very specific function. Without knowing what, exactly, qualifies as a "backup" it's a little difficult to know how useful this info is. Still, at least this info has been added to the Dashboard where it belongs.